Treat Yourself to Cosmetic Dentistry in Raleigh, NC! Are you confident in your smile? 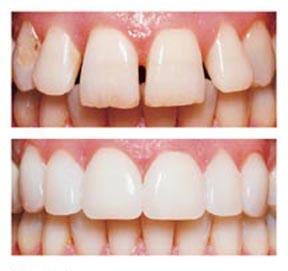 Have you ever wished you could straighten, whiten, or altogether change the appearance of your teeth? Adams and Cheek Dentistry in Raleigh, NC is here to the rescue! A smile is the first thing people notice about you and is an international sign for happiness. We believe everyone deserves a smile they are proud of. Here at Adams and Cheek Dentistry, we offer several different options for you to improve the appearance of your smile. Veneers are thin, tooth covering “shells” that fit on the front side of teeth and provide an option for changing size and color of front teeth. All ceramic crowns are another option to change the size, shape, and overall color of teeth. Bonding is filling material matched to the specific shade of your teeth used to fill in chips or small gaps in between teeth. The American Academy of Cosmetic Dentistry answers more questions about cosmetic dentistry on their website. You deserve a smile you are proud to show to the world! Treat yourself to cosmetic dentistry in Raleigh, NC. Call us at Adams and Cheek Dentistry at (919)866-1360 to schedule your appointment today. Or click here to schedule online. PreviousPrevious post:Gold or Porcelain, That is the Question!NextNext post:Can Mouth Guards Prevent Concussions?